Home Biafra featured ENUGU EXPLOSION; ARE NIGERIAN FORCES TAKING ADVANTAGE OF IPOB ELECTION BOYCOTT? ENUGU EXPLOSION; ARE NIGERIAN FORCES TAKING ADVANTAGE OF IPOB ELECTION BOYCOTT? The imperatives of this question is as a result of the undisputed peaceful and civil approach of Indigenous People of Biafra to the quest for the restoration of the sovereign state of Biafra. IPOB has maintained non-violence agitation even at a boiling point we felt they would lose their non-violence nature. Unprovoked massacre became a norm in the recent times; unarmed people of Biafra on a peaceful protest bundled and killed. Murderous Nigerian forces embark on night raids; forcing the people of Biafra to disappear. Children made orphans; fathers made widowers and mothers made widows but that never pushed IPOB into violence. The most recent act was the invasion of the home of the leader of IPOB where over 28 people were killed in cold blood. The cousin of the leader of IPOB was also murdered with no living thing spared in his home. Nigerian invading soldiers designed his home with blunt holes of bullets as it rained like August rainfall. The unruly soldiers also ransacked his home and stole valuables; money and personal belongings to the extent the people suspected hungry soldiers had carried out the raid. The people of Biafra have been provoked to the brim that if violence was ever an option; they would have embraced it but instead, civil disobedience was a way to fighting back and that led to the declaration of no-election in Biafra land and starting with Anambra state but then, Enugu state council election will come first. Last two days; while the people of Enugu state glued to the order to boycott election as means of pushing for a referendum, unusual thing happened. There were reports of multiple bomb blast in various polling stations and the attackers have not been fished out up to this moment which may heat up the polity in Anambra state election. This has left Enugu state in doubt over future elections; the people’s safety is no longer guaranteed. Recall that the Nigerian establishment declared IPOB a terrorist group but the world refused to agree with them on the basis that IPOB is a legal establishment on the quest for self-determination which is consistent with 2007 UN charter on the rights of Indigenous People. That was a major setback for Nigeria; going further, they could not provide enough evidence to compel or make the world agree with them that IPOB is a terrorist organization. Nigerian establishment has gone to court to force USA to tag IPOB a terrorist organization, they have protested and used its diplomatic strength to achieve that aim but to no avail. 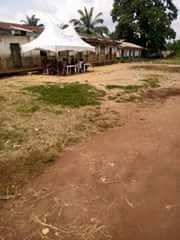 Nigerian state has shown desperation and with the unusual bomb explosion in polling stations at a period IPOB vowed to boycott election is nothing short of taking advantage of the boycott. The only thing Nigerian establishment wants to get from the state sponsored bomb attack is to link it to IPOB and further push for IPOB to be labeled terrorist organization. “They are bombing polling stations to kill citizens because they don’t want citizens to vote which is against their order. With this; it is high time you agreed with us that these people are terrorists” this is the clear message they intend to pass with bomb explosion in polling stations. On the contrary; Nigerian establishment has tagged IPOB terrorist; it was gazette’ and Nigerian forces have the right to kill and arrest IPOB. IPOB has no identity but the people of old eastern region and every single one of them is a terrorist by virtue of that tag. Killing of the people of Biafra has been justified with that tag; planting bombs on polling stations to kill the people of Biafra is nothing but in line with the tag. Had Nigeria respect for the lives of the people of Biafra; it wouldn’t have tagged them terrorist with the awareness that it would expose them to all kinds of threat. Bomb explosion in Enugu state is part of taking advantage of the terrorist tag to kill and maim the peaceful people of Biafra. Nigerian murderous forces have the opportunity to carry on their killing business by planting bombs to target the people of Biafra. Boko haram also have the opportunity to come in police uniforms and continue their attack against Christians in Biafra land. The Nigerian establishment has maliciously exposed the people of Biafra to death and horror. Having tagged them terrorists; anybody is free to come in and collect his own pound of flesh because Nigeria has sanctioned business of terrorism in Biafra land. When such terrorist act is carried out; instead of fish out the perpetrators; Nigerian government would quickly say it was carried out by them because they are potential terrorists or it was carried out by IPOB because they don’t want election to hold. Finally; Nigerian establishment is creating a situation they won’t be able to contain in a quest to justify or force the world to agree the terrorist tag on IPOB. They can successfully continue to plant bombs and explode them to justify their tag but when this wicked act will take toll on Nigeria; it would be disastrous to all and sundry. The quest to make Biafra land North East will be opposed by the law-abiding and peaceful people of Biafra. With this development; I urge the people of Biafra to continue to stay indoors and avoid congregating where could make a soft target. Polling stations and election centers are the places they can thrive and our people must distance themselves from such places to avoid death and the fulfillment of their plan. They would love to thrive in a place they can turn back and accuse IPOB; hence IPOB has vowed to boycott election, they would take advantage of election grounds to attack the people and turn back to say IPOB carried out the terrorist attack to complement their no-election vow.